Turtle Bay Swansea for a child-free Sunday lunch! 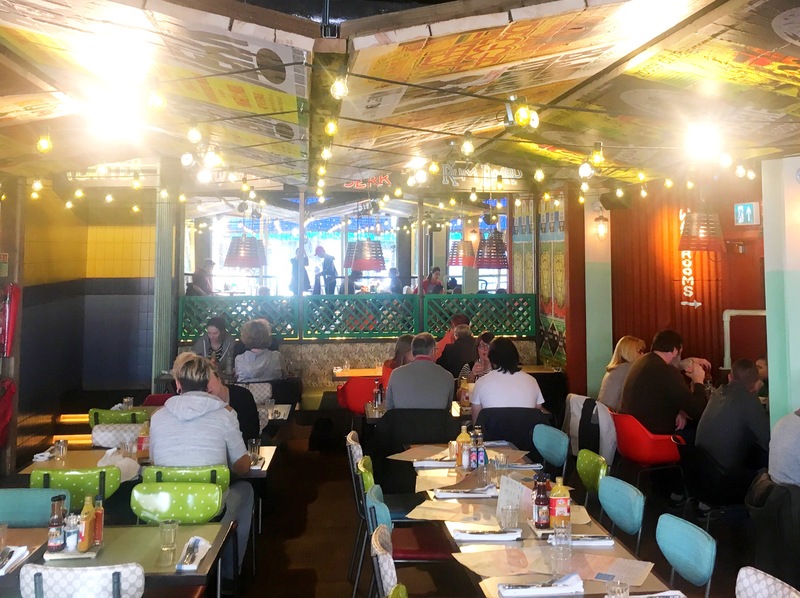 Turtle Bay Swansea opened a couple of months ago, and I’ve been keen to try it out after hearing good reviews about the Cardiff branch. 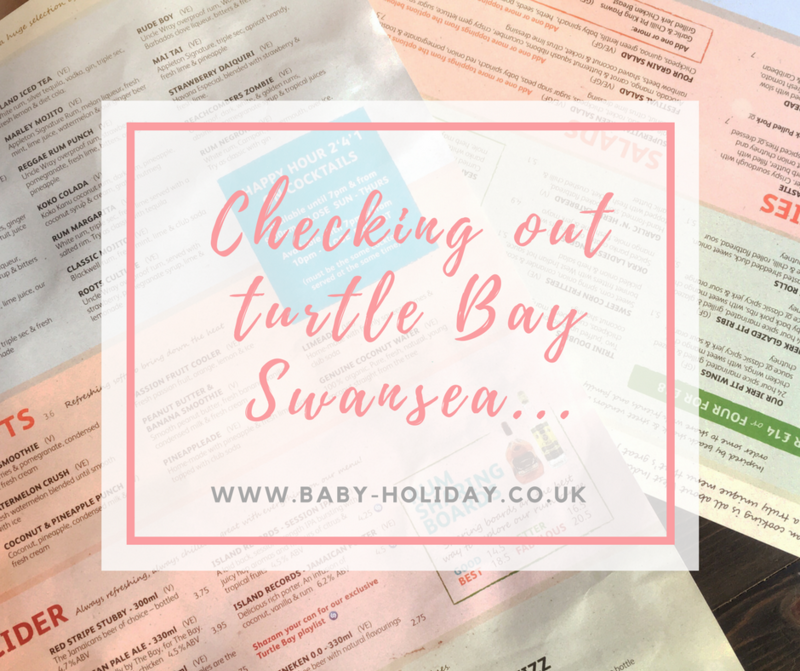 When we had a couple of child-free hours a few weeks ago we headed straight there to escape the drizzly Welsh weather in favour of some Caribbean sunshine … well, we will be trying the real deal next month, so it would have been rude not to! 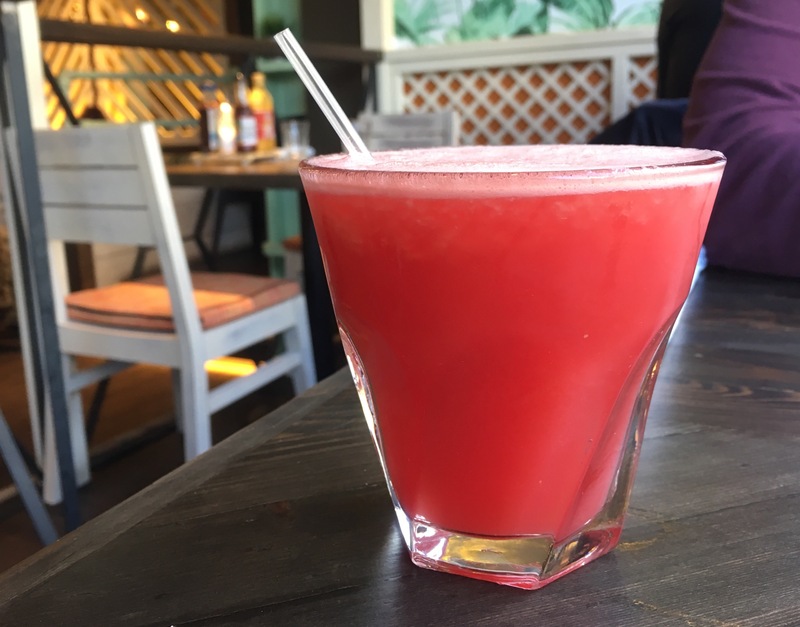 Turtle Bay prides itself on rum (winner), reggae and hot flavours, so I was excited to see what it was like. 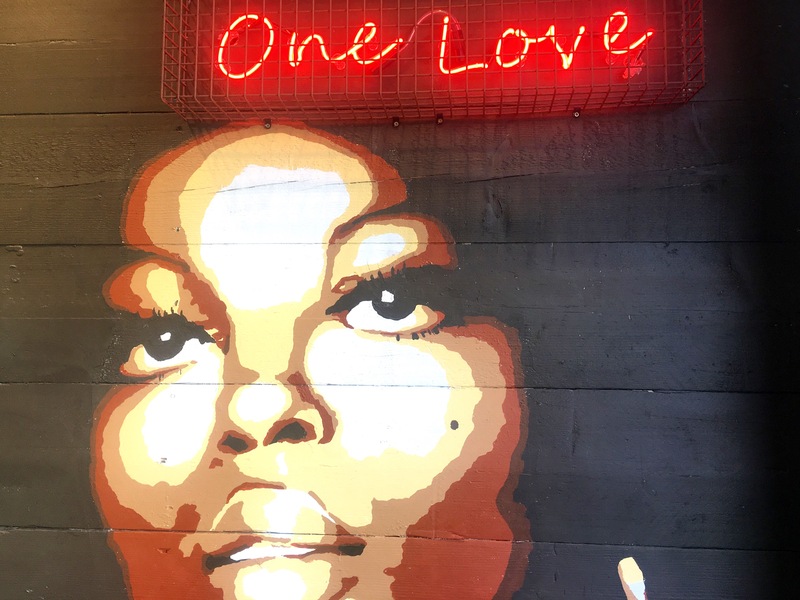 Walking in, we were welcomed by some Bob Marley inspired artwork at the entrance, and a cheery member of staff who showed us to a table in the window – perfect for people watching. I instantly liked the feel of the restaurant, with bright colours, palm leaf wallpaper and a central rum bar with each corner named after a different Caribbean beach. Have I mentioned that Turtle Bay specialises in rum?! As we were handed the menu, the waitress let us know it was happy hour with two-for-one cocktails. I was a bit gutted that Stew was working nights and I was on bedtime duty and couldn’t try a couple – next time! Instead, I browsed the Caribbean Softs section and went for a watermelon crush, which was amazing! The coconut and pineapple punch, and elderflower cooler both sounded lovely too. Stew had his usual Coke, which was served in a glass milk bottle with a straw – I thought that was a nice touch. There are over 20 different cocktails to choose from, as well as beers and wine … and happy hour lasts for ten-and-a-half hours! It took some time to study the menu as we’d never been before and wanted to check everything out before deciding. I was torn between a jerk chicken flatbread and trini chicken curry, although I was tempted to be really good and have a salad (you choose to add jerk chicken, halloumi and fresh mango, chilli squid or garlic and chilli prawns, so it’s more exciting than your standard salad!). Stew went for the flatbread and I don’t like ordering the same as it means you can’t try the other person’s food, so I had the curry. We also ordered a side of sweet potato fries (as Stew was worried his flatbread wouldn’t be enough). 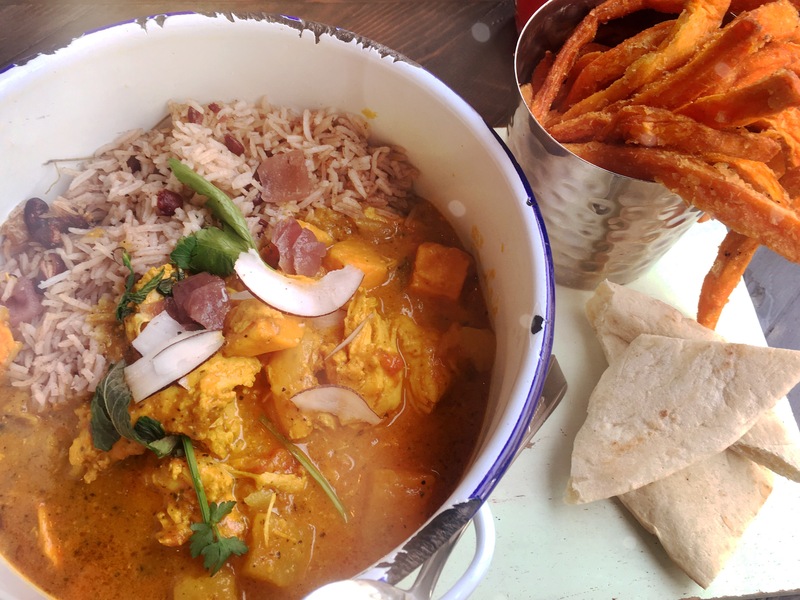 My curry was from the “one pot” section of the menu, where the meals are described as “rich, slowly simmered and uniquely Caribbean”. True to its name, the curry and rice were served in a white enamel pot, which when opened released the most amazing smell of coconut, mango and spices. It came with coconut rice and peas, and a roti flatbread, which helped to take the spice away when dipped in! I’m not usually one for hot food, and was worried it might be too spicy, but the flavours were so nice that they took the edge off. The sweet potato fries were a nice addition too. Stew’s flatbread was served on a wooden board, and he didn’t need to worry about it being too small! 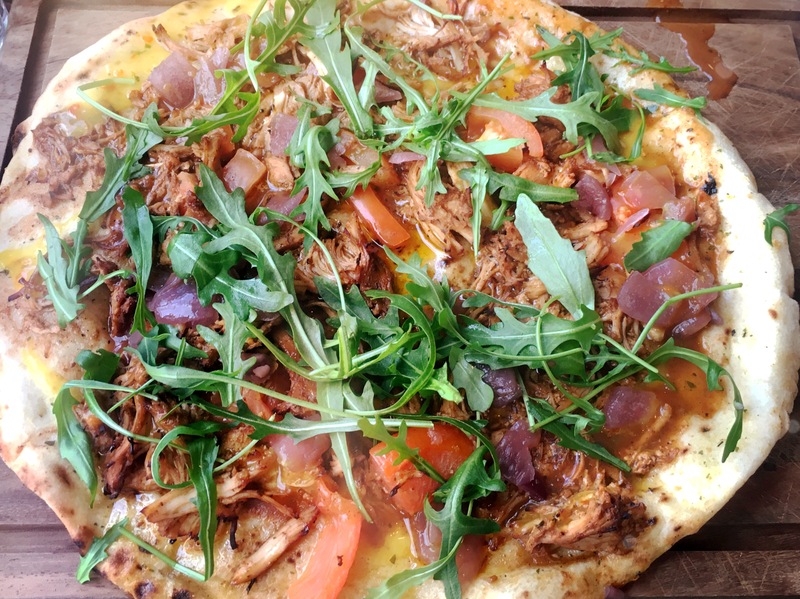 It was more like a pizza, with jerk chicken, fresh tomato, rocket, sweet onion chutney and Caribbean hot sauce 7. I was a bit jealous because I love bread and pizza, and it looked so good. When Stew eventually offered me a piece I discovered it tasted as good as it looked. Stew found it a bit spicy, but I think it was that the more you ate the more the spice built up in your mouth. We definitely didn’t need to add any of the extra hot sauces to our meals! It was fairly quiet, so we couldn’t check out what other people were eating, but as we were leaving I spotted someone’s sandwich and it looked so impressive! I’m assuming it was the Kingston Toastie with curried chicken, and it was huge. Not your usual chicken sandwich. I might well have that next time we go. There are also burgers, jerk BBQ dishes, wraps, and starters which can be served like tapas if you want to try a few. As we were there without our boys we weren’t offered the Little Turtles children’s menu, but I’ve had a look online and it’s things like chicken breast, cheese burger or normal beef burger and chicken flatbread. These are served with fries, rice, rice and peas or salad and cost £4.50. As I mentioned above, the restaurant is nice and bright with Caribbean inspired artwork and posters, It’s quite big, but separated with booths and things so it feels more intimate. We were sat up a couple of steps overlooking the street, where there are also some outdoor tables and chairs for the summer. 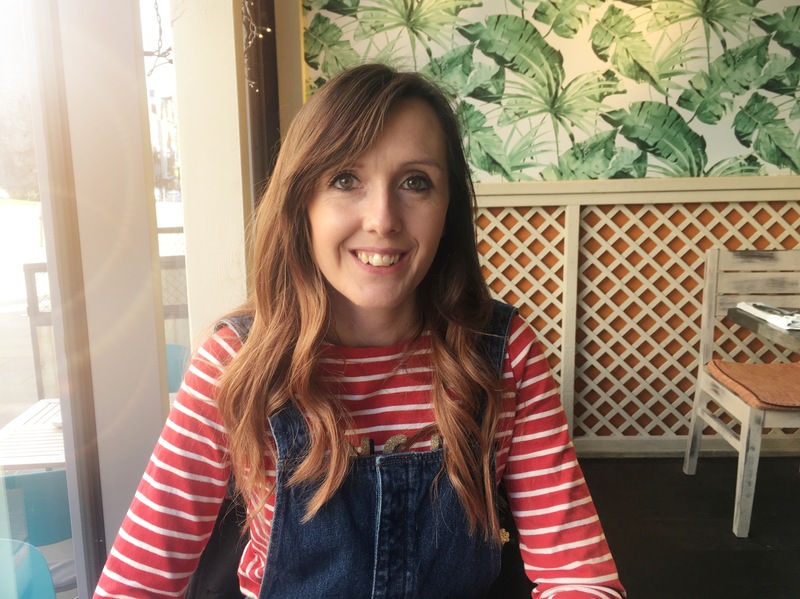 There’s a mix of floral and palm patterns, stripes, fairy lights, rum and hot sauce posters, and colours include red, green, yellow and blue – you name it, it’s there! Food is cooked in the “jerk pit” open kitchen, and drinks are served at the central bar. *Why not follow us over on Facebook, Instagram or Twitter to see more of what we get up to?